Choreographer Alexei Ratmansky is revitalizing the world of ballet with a balance of satire and reverence. Alexei Ratmansky has a calm and elegant presence, somehow appearing both vaguely aristocratic and deeply casual at the same time. The former artistic director of the Bolshoi Ballet and veteran dancer has fully matured as an artist, becoming, unarguably, one of the world’s great choreographers. Lights on at the Bolshoi! And while his work consistently reflects his Russian roots, he thrives in the United States. Since 2009, he has been artist in residence at American Ballet Theater. He has also made New York his home, or at least one of them. On Nov. 9, Ratmansky was rewarded with a cross-cultural affirmation of his stature. He was awarded the Liberty Prize at the Russian Consulate on 91st street, a nod to his gifts and his ability to move ably as an artist and cultural ambassador between Moscow and New York, and all the major ballet cities in between. The award and an undisclosed cash prize has been bestowed every year since 1999 by three prominent Russian Americans - artist Grisha Bruskin and writers Alexander Genis and Solomon Volkov. Past winners have included writers Vassily Aksyonov and Vladimir Sorokin, and publisher Irina Prokhorova. Straining above the din of celebration at the New York consulate, Ratmansky thanked the Russian-American organizers of the award. “Above all I am grateful to my profession,” he said. “And I am lucky that in ballet it is possible to be a patriot in all innocence,” he said, meaning that he is lucky to serve his country through his art. Ratmansky also spoke of his tenure on American soil, which in many ways has been more nurturing and less controversial than his stint as the artistic director of the Bolshoi, where he learned the constraints of managing artists and being an artist at the same time. “If you put on a good production, they will embrace you here and welcome you eagerly,” Ratmansky said of the U.S. “And if you talk about the repertoire of classical ballet, more than half of it is Russian. It’s prestigious to be a Russian choreographer in the U.S., where there is such respect for Petipa, Fokine, and other great [choreographers]." In 2010, Ratmansky bravely took on American ballet’s predictable holiday spectacle, “The Nutcracker,” and transformed it into something deeper. Critics were thrilled: “Made with complete theatrical authority from first to last, it shows many aspects of Mr. Ratmansky: satirist, storyteller, dramatist, poet,” wrote The New York Times. American Ballet Theater performs Ratmansky’s “Nutcracker” from Dec. 7 through Dec. 16, at the Brooklyn Academy of Music Opera House. While Ratmansky knew better than to try to revolutionize a cash cow like “The Nutcracker,” he also knew he could make the ballet better. Ironically, this ballet is the single reason many ballet companies survive financially. The ballet, based on the children’s tale by E.T.A. Hoffman, was not well received in Europe and Russia when it premiered in 1892 - critics uniformly panned the early productions. Tchaikovsky did not live long enough to relish its eventual and indomitable popular appeal. The 44-year-old choreographer, who was born in St. Petersburg (then Leningrad), has said in many interviews that he was never a huge fan of the original ballet. He felt the music was overexposed and hard to feel anew. But Ratmansky breathes life into the work, which reveals a dreamlike maturation of protagonist Clara, a role originally danced by Veronika Part, an extravagantly generous and virtuosic dancer. Ratmansky chose to change the climactic pas de deux, and choreograph it between Clara and the prince, who are the main characters of the ballet - rather than the prince and the sugar plum fairy. The duet is more powerful and mature in its rendering. At a rehearsal for the premiere, Ratmansky appeared relaxed and confident in ABT’s Broadway studio. "At American Ballet Theater, I don't have to waste time explaining why I want to do this or that or convince people to follow me,” he said at the time. “They understand that this is their job." 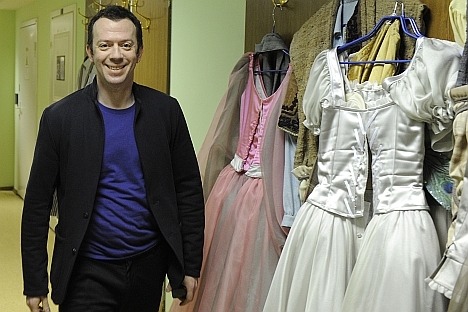 At the Bolshoi, Ratmansky recalled, "There is a cult called 'We are the Bolshoi.' It's limiting on one hand. On the other hand, there is a sparkle. Sometimes the self-importance leads to great performances." When Ratmansky was at the helm of the Bolshoi, the company experimented for the first time with the modern choreography of Twyla Tharp. He also restored a long forgotten Soviet-era ballet, "The Bright Stream," to the music of Shostakovich in honor of his 100th birthday. Ratmansky’s passion for the Russian avant garde is something devotees are sure to see more of in the future. Critics and balletomanes agree: Ratmansky has had a profound impact on dance in the past decade. Recently, the Mariinsky Ballet brought his Cinderella, spare and dark, to the Kennedy Center. The ballet, showing a contemporary vision and sinister edge, is controversial. Yet it reflects a vision that ballet is a living art form, with a dynamic future.